Why join RJC as an association? Access to materials to use in educational activities within the membership. Ability to demonstrate leadership in CSR and responsible sourcing issues to your membership. A vehicle for developing practical solutions in consultation with industry, civil society and government. Opportunities to contribute to and benefit from the various ongoing collaborations and engagements the RJC is involved in. An association with members actively involved in the diamond, gold and platinum group metals jewellery supply chain. 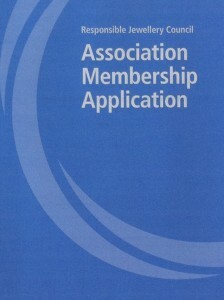 Association Members are not required to seek RJC certification. Promote RJC Membership and uptake of the RJC Code of Practices. Educate your members about the ethical, social, human rights and environmental challenges that are faced by the diamond, gold and platinum group metals jewellery industry. Comply with the Antitrust Policy and Rules adopted by the Council in its dealings with the Council and other Council Members. Comply with the Rules adopted by the Council for the use of its logo and intellectual property – an Association Member is not entitled to authorize its individual members who are not RJC Members to use the Council’s logo or other intellectual property.